Remove the skin from the oranges with a sharp knife making sure there is no pith left on the segments. Remove the segments and put to one side. Remove the flesh from the passion fruit by cutting in half and scooping out with a dessert spoon. Toast the almonds on a baking sheet in the oven until golden brown. Trim the green beans and cook in salted boiling water for 3 minutes until tender. Drain and season with salt and pepper and a drizzle of olive oil. Season both sides of the duck breast with salt and pepper. Cook the duck breast skin side down in a frying pan over a medium heat. As the duck releases fat, drain this off and continue until the skin is crispy and golden brown. Turn it over onto the flesh side and brown all of the flesh. Remove the duck from the pan and add the orange juice and sugar to the pan bring to the boil. Allow this liquid to reduce by half and then return the duck breast to the pan. Keep turning and coating with the liquid until the duck breast is firm to touch and it is nicely glazed. Allow the duck to rest for 5 minutes before serving. To assemble the dish: slice the duck breast into thin slices. Season with salt and pepper. Mix the green beans with the almonds and place in the centre of the plate. 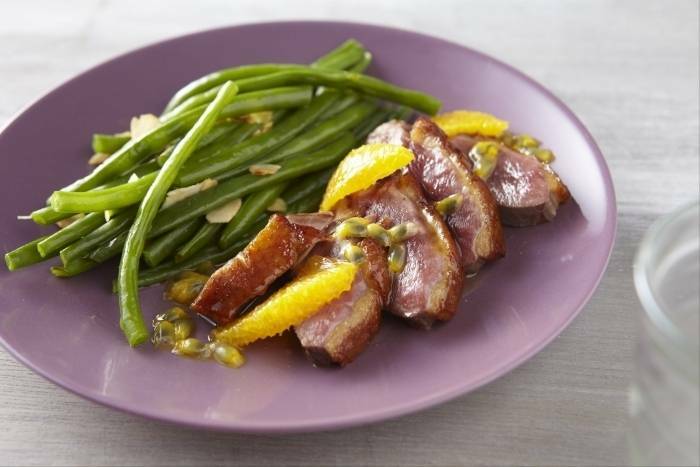 Place the sliced duck on top and decorate with the orange segments and passion fruit seeds.